It has been reported by the BBC today that the amount of disposable income available to us all it at its lowest level since 1977. I’m certainly feeling the squeeze as bills, tax and inflation all rise yet salaries seem to be frozen and savings cannot earn any interest. What would i do with £1,000 a year? Probably take a holiday that i’ve not had since who knows when, maybe join a gym and live a healthier lifestyle, certainly put some of it away for the future as my pension fund is non-existant. The feed in tariff strikes me as an obvious solution. If i take my hard earned savings and put them into solar power on my roof, i will be able to generate energy, which i will be paid for by my energy supplier – nice to get something back from them for a change. This income could see me being about £1,000 a year better off, better than that the payment is linked to inflation so i will really receive this benefit every year until my fifties! The feed in tariff is also tax free so i can take that as income and start to contribute some of my salary into a pension fund, as i am contributing more i am paying less tax and also my employer has to match my contribution making the feed in tariff work even harder for me. I believe i’ve done my sums right and from this simple and renewable installation i will be able to have a holiday once a year, join a gym and live a healthier lifestyle and even retire earlier than would otherwise be possible. Solar PV systems installed yes, registered no. Technically speaking a solar PV system Installed on a domestic propoerty should never be larger than 3.68kW. Why? Simple physics. Your home’s ring circuit is rated to 16 Amps and electricity is supplied at 230 volts. Multiplying these two numbers gives you the maximum power that should be connected, 3,680W, or 3.68kW. While I agree that efficiencies in the inverter will mean that the peak power of the solar panels is rarely reached, thats not the point. By installing more than 3.68kW you are risking the safety of your home on that rare sunny day when the panels over perform. Your network operator has very clear guidlelines about the procedures for installing systems of more than 3.68kW – they’re called engineering recommendation G59. Trouble is that G59 is a long and costly application process that installers simply cant be doing correctly before they put your 4kW system up. The consequences of not registering your system could unbalance the national grid forcing your network operator to take action. This action will be a request to disconnect your unregistered system, which of course means no more feed in tariffs. Be careful when your installer tells you that you can fit a 4kW system on your roof. 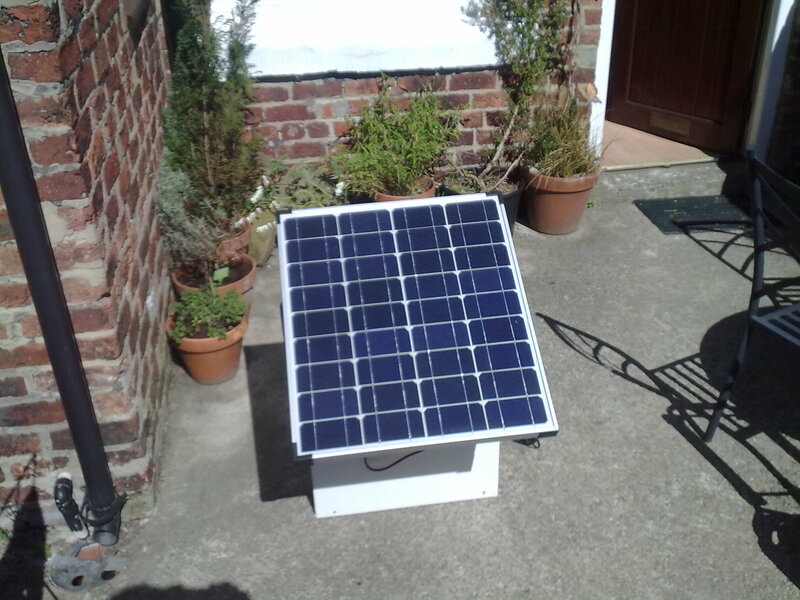 I spent the weekend out in the sunshine recycling an old desk into a state of the art mobile solar power unit. Coming soon to a car park near you, Energy Friend will be there with the unit to offer free mobile phone charging or basically power for any device that you want to bring along. Why can we do this for free? Because the energy from the Sun costs us nothing. While you’re there putting free, renewable energy into your mobile device we can look at whether or not your home could benefit from solar electricity too, this advice is also totally free. The glorious sunshine this weekend enabled be to not only charge up my phone, but also power the drill I was using to put the unit together and there was still energy to spare. In a real system this would mean that not only would I be powering my home devices for free but I would also be exporting excess energy into the grid – getting paid for it and enjoying the satisfaction of knowing that my free, renewable energy was contributing to lowering carbon emissions. The unit itself consists of a 40W solar panel, a 12V leisure battery, a charge controller, an inverter and multiple outset power sockets. : 2 x 12V cigarette sockets, 6 x 230V mains sockets and 2 x USB power sockets. You may think that by having a battery in, I am cheating and the power is not really coming from the Solar Panel, but this battery/inteverter combination in the unit replaces the job of the inverter in your domestic solar power system. The inverter in your homw ensures that the electricity being supplied is is done so at a voltage that can be accepted by the devices in your home and by the grid. In our mobile unit the battery ensures that the current is regulated to avoid any damage to mobile devices that are plugged in. Having read Forum for the Future’s “Funding Revolution” guide last week, I decided that it was too important to keep to myself! If you would like your community to get more involved in protecting the environment then this guide will be extremely useful to you. The main theme of the Funding Revolution Guide is the idea of a Revolving Fund, an organisation that can make agreements with investors to purchase assets such as energy generation equipment, lease places to install this equipment, or make loans for other carbon saving projects. For example, it works particularly well with Solar PV (solar electricity generation); where money is invested in solar panels installed on the roof of a house or community centre, the revenue from the Feed-in Tariff is then re-invested in solar panels for another house, and so the cycle continues. The long-term changes you will see as a result of these revolving funds include community support and engagement and green credentials for the community. These changes can lead to increase in the market value of houses in that community, and lower energy bills for the individual or community. However, arguably the most important benefit is that it offsets the often large initial costs of installation etc; which is the predominant reason why households and communities are reluctant to invest in renewable energy systems. Of course it’s not just about renewable energy generation, the fund can go towards more effective community recycling projects, cavity wall and loft insulation, or even a seminar for local residents on how to conserve energy. This may sound like a fantasy to some readers but believe it or not communities like this already exist in the UK. Kirkless Council’s “Recharge Fund” has helped with low carbon technologies, West Oxford Community Renewables has installed solar panels on local buildings, and Hook Norton Low Carbon has assisted the local community to reduce its carbon footprint over a number of years. You can read about all this and more in Forum for the Future’s Funding Revolution Guide by downloading it at http://www.forumforthefuture.org/projects/funding-revolution.